They should make you comment explaining if you downvote someone. It's wrong to downvote someone who is (presumably) successfully raising 8 kids. But, to second SF above, what is the question? cook in bulk and plan ahead. We always have farm raised boiled eggs ready to eat. Broccoli, cauliflower, radishes, black olives, green olives, and pickles are cleaned and stored in their own containers shelved kinda like they are on display. Bacon is pre-cooked. Macadamia nuts, walnuts and pecans are always on hand. Sometimes lunch is just basically one of everything. Make these foods easily accessible, (we dedicate 2 shelves in the fridge) and make them look appealing in the fridge. (spaced out glass containers) Hopefully, they will self-serve and their appetite will guide them. Slowly eliminate processed foods in a way the kids barely notice. You don't want a mutiny! As a parent of 8 myself, I understand where you are coming from. I think that baby steps is the answer. As Methodician said, don't force it down their throats. Most of mine are either grown or older. I have a baby who is 11, so I probably have a different dynamic. You can start by substituting processed foods with good alternatives that are easy to make. Are you used to fish sticks? Most of us now love orange glazed salmon. In order to support my husbands B12 issues I found a source of locally grown grassfed lamb. I found a great meatloaf recipe which could be made ahead and I just use an icecream scoop to make giant meatballs so that it bakes fast. Roasts in crockpot, bone broths into homemade soups, it gets easier as time goes on. We have eggs for breakfast all the time. I chop up stuff for omlets in advance so that I can throw them together quickly. I have a Weston A. Price cookbook which has come in handy a time or two even though I don't eat the grains. I've used their turkey sausage recipe and make the seasoning ahead of time. I have one kid who loves pasta so I don't fight her on it. I have on occasion made her cook it herself. I give my kids a choice to take lunch at school or from home. My high schoolers want hot lunch, so I don't force it. It has to be their conviction. They play soccer, do cross country and are generally healthy. But they do know that at home, mom is cooking her way and that's it. I try to repeat the favorites often. If my college age kids want something different than what I buy, they buy it themselves. Some things we have accomplished without fail are the healthier fats, tossing the corn syrup and reducing the processed foods. It took over a year, 45# of my own weight loss, and the healing of some of my own issues before some people really started to respect my decision. My own husband had some tough health issues that were helped when he finally became convinced. All in all I feel good including reducing migraines and recovering from an injury just over a year ago. Some people think it's too expensive, but I've managed to find ways to keep the budget tight. Convenient and cheap will cost in the long run. Best wishes making it work for your family. Buy Paleo foods and stock them. Reassure family and baby sitters that saturated fats and cholesterol are NOT evil, and make it crystal clear to the sitter that veggie oils and processed foods are not acceptable in your home or the diets of your offspring. You can adopt it whole heartedly but you can only hope to have a strong influence on those around you, at best. Don't force it down their throats. They can always find a way around it. Learn some of the more delish but EASY recipies and teach them preparation skills. Hopefully the seeds you plant will stay with them for a lifetime. 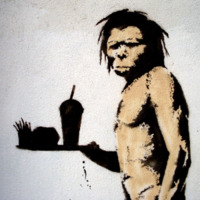 Paleo isn't as difficult to follow as it seems at first.